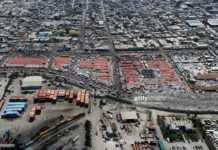 On Wed., Oct. 17, 2018, tens of thousands demonstrated, mostly peacefully, in almost all of Haiti’s major cities – including Jacmel, Les Cayes, Gonaïves, Cap Haïtien, St. Marc, and Port-au-Prince. 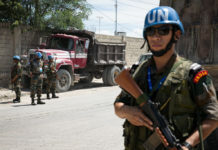 Nonetheless, sporadic incidents and clashes left two dead and 11 injured by gunfire, according to a first assessment of the Haitian National Police (PNH). Eleven police officers were injured by stone throwing, eight PNH vehicles were burned, and there were eight arrests. In Port-Prince, many thousands of Haitian women and men marched through the streets to demand, yet again, that light be shed on the waste of some $3.8 billion in Petro Caribe funds. 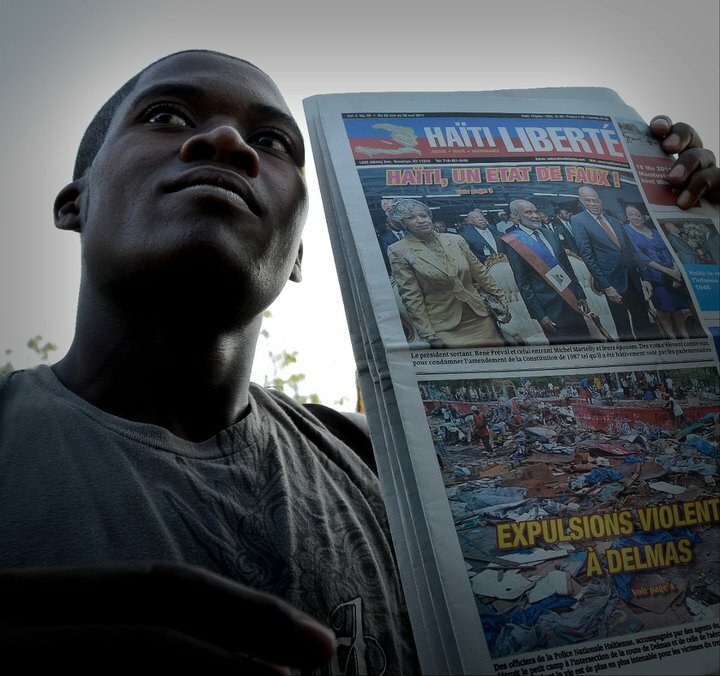 It was the largest demonstration organized in Haiti since one organized on Feb. 7, 2004 on the Delmas Road (estimated at about one million) in support of then President Jean Bertrand Aristide, although he was overthrown, with the help of a U.S. Seal Team, 22 days later. The Oct. 17, 2018 demonstration also brought together a multitude of people including children, adults, senior citizens, and young people – both high school and college students. 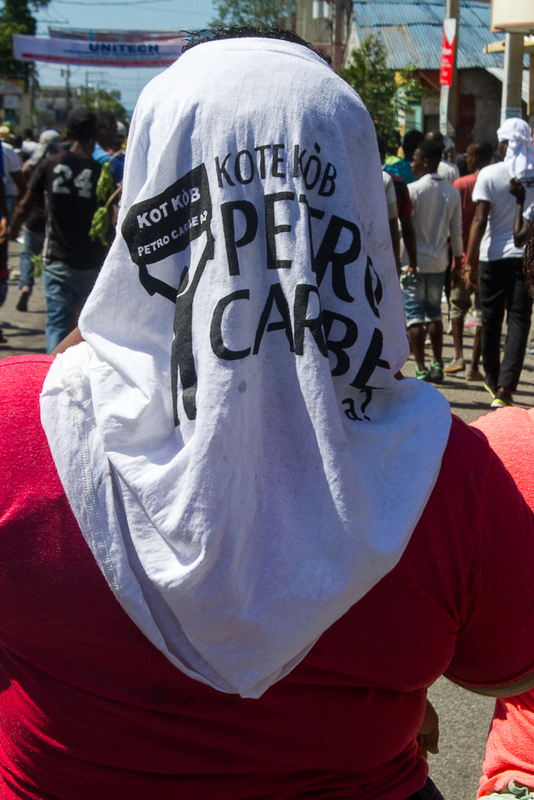 The demonstration was marred by violent clashes between the police, who fired live ammunition, rubber bullets, and tear gas many times, and protesters, who fought back by throwing rocks and bottles and setting up burning tire barricades. The demonstration lasted more than five hours, despite the PNH’s futile attempts to stop it. The resulting anger caused the the windows of several businesses to be broken and several cars to be smashed or burned. Despite all public transit being suspended and all state offices being closed, floods of people poured out from everywhere to respond to the call for the massive protest by youth and opposition organizations, issued several weeks ago. Demonstrators in St. Marc blocked the highway to the north with large rocks. 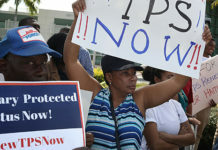 In Cap Haïtien, police also fired on large crowds of protestors, who threw rocks at the government’s gleaming white office building on the central square. 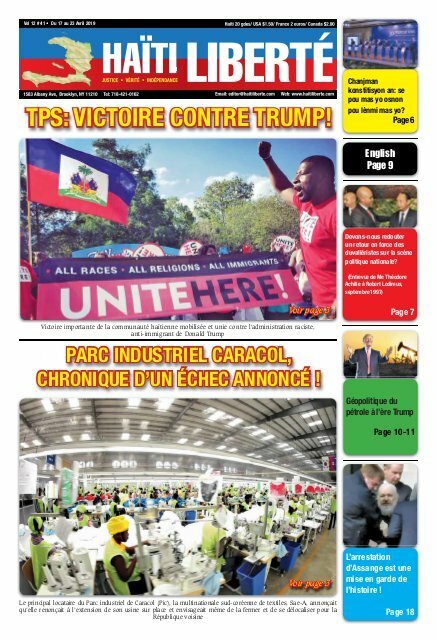 In Aux Cayes, reports say one person was killed, two wounded, and three arrested after demonstrators clashed with police. Five PNH motorcycles were burned. 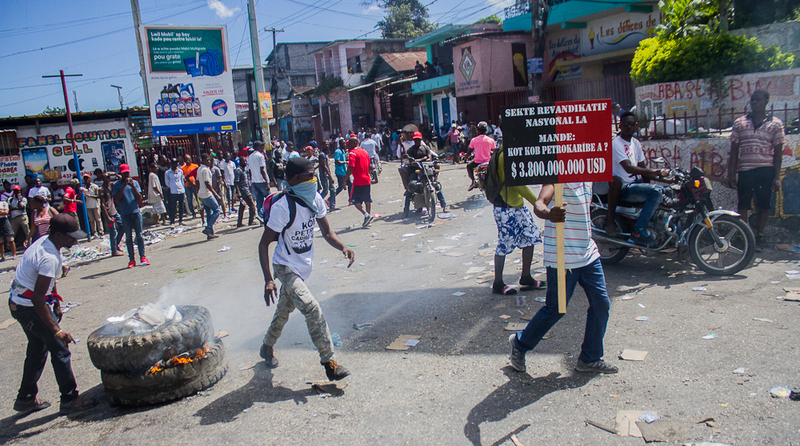 In Jacmel, thousands also demonstrated, resulting in at least one arrest and two motorcycles being burned. 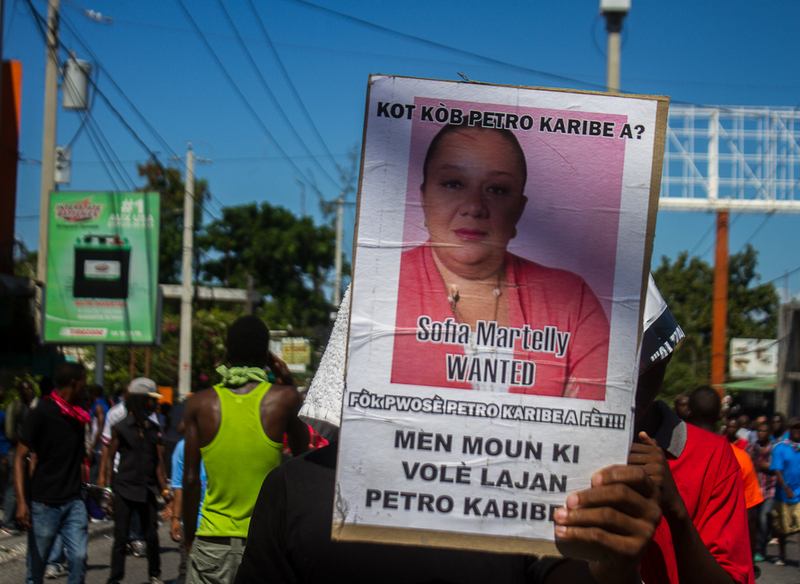 Most protesters nationwide demanded the resignation of President Jovenel Moise, who has repeatedly expressed no interest in trying the people involved in the squandering of the Petro Caribe Fund over the past decade. October 17th marked the 212th anniversary of the assassination of Jean Jacques Dessalines, Haiti’s founding father, at Pont Rouge in the capital. 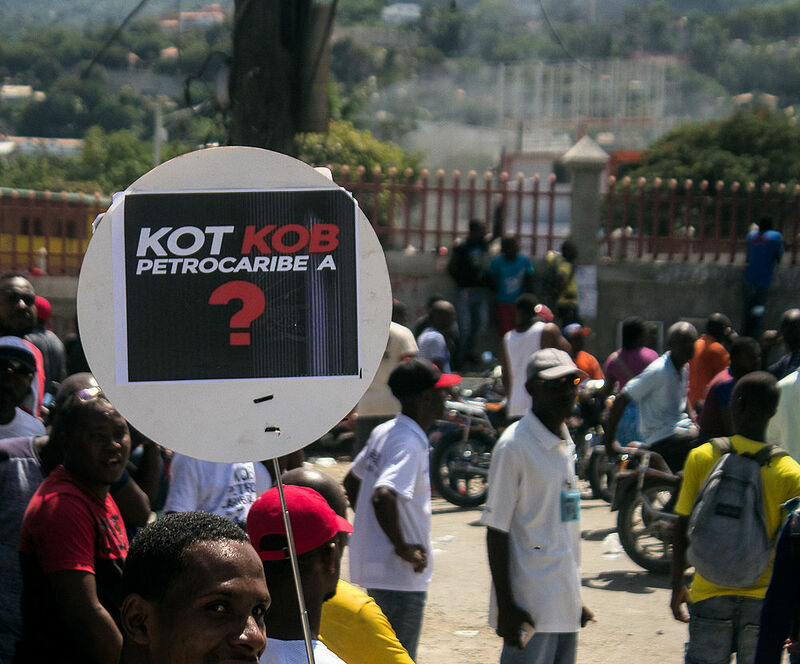 Government officials’ attempt to carry out the traditional commemorative ceremony at the assassination site was disrupted by protestors who accuse Jovenel Moïse of being an accessory in the embezzlement of PetroCaribe funds.